Get out and about this spring and discover Farnham on foot during the Farnham Walking Festival. Thank you to our main sponsor the Abbeyfield Wey Valley Society and to Southern Co-Op for their support. 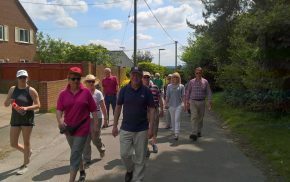 The Walking Festival is organised by Farnham Town Council and a team of volunteer walking enthusiasts. The two-week long event includes over 30 guided walks ranging from half-mile strolls to 14-mile hikes. The walks are free to join but booking is essential. The Festival starts on Sunday 19 May and ends on Sunday 2 June. There are walks in the morning, over lunch, afternoon and early evening. There are 34 walks which cater for a range of interests and walking abilities. Farnham’s brewing history, and lot’s more! The great variety of walks means there is something for all ages, fitness levels and walking abilities. There are also walks suitable for families. Each walk is led by an expert in their field. They will take you on a journey of discovery and share their knowledge about local history, heritage and archaeology through to art, nature and Farnham’s industrial past. Download a copy of the Farnham Walking Festival brochure or visit the Farnham Walking Festival website for full details about the walks. The bookings are being managed by Farnham Walking Festival volunteers. Please visit their website to book. Are dogs allowed on the walks? See the walks programme to find out which walks are suitable for dogs. To ensure the safety of all walkers, owners must ensure their dog is kept under control. The Abbeyfield Wey Valley Society is Gold sponsor of the 2019 Farnham Walking Festival.